... to the 7th Dominic Morrogh Trust newsletter! We wanted to get this out in time to wish you all a very Happy Christmas and New Year. But also to say Happy Birthday to Dominic, who we have to say is looking physically stronger and healthier (and could we say younger) this year. So on this note a big thank you to all of you for your incredibly generous and continued support for Dominic, which we believe plays a core role in helping Dominic be physically comfortable and healthy. In this edition, we just wanted to take the opportunity to highlight a few of the therapies Dominic is getting as a result of the fundraising and donations you all have done for the Dominic Morrogh Trust Fund. We hope this gives you an idea of how these therapies have been benefiting Dominic and how they potentially could help others in a similar situation. We also include an update from Tara on Dominic’s long term care, which we have finally had some good news on. Please also find a short roundup on the recent fundraising events and also do join us for our our next big event, the Valentine’s Day party in Cork on February 17th. Thanks again for all your support and the best wishes for a very Merry Christmas and Happy New Year! Thanks to you all for making your voice heard for Dominic and fighting for his right to stay in the Royal Hospital at Donnybrook: we recently got confirmation that they have now created a long-term space for Dominic in the hospital. We no longer have to live with uncertainty about where he will reside. They are in the process of building additional space for Dominic and a few others, in what we consider one of the best residential spaces in Ireland for people like Dominic who are in a minimally conscious state. We believe that, given the quality of nursing, occupational and physio staff there, as well as the accessibility to medical staff and the layout of the space, Dominic's needs will be well taken care of. Having looked extensively at a number of other options, we truly feel this is the best outcome we could have in view of his situation. One year ago things were looking a lot bleaker. We were told Dominic had no secure long-term bed at the Royal Hospital. We were devastated and turned to you all to help us fight his case. From there, we went public for the first time about Dominic's story, through Acquired Brain Injury's campaign 'Don't save and then leave us'. We told his story and highlighted the lack of certainty we had for Dominic on accessing services and having a place where he could be well looked after. This was four years post injury. Even four years into it, we still had no guarantee Dominic could remain in the facility which we thought best suited his needs. You all made sure that we were not alone in making his voice heard. After we were on the radio with his story, we launched a petition, which over 2,700 of you signed, asking for the government to invest in services for people who had acquired a brain injury. When his story was carried in the Evening Echo and on thejournal.ie, you shared it via social media, making sure that Dominic's story reached a wider circle. There is still so much uncertainty in Dominic's life, yet we, as Dominic's voice and community, have collectively made strides for him. Our call to action for Dominic was heard. As a result, we have helped ensure that one of Dominic's basic needs of abode is being met and at a level in which we feel is of the quality he needs. I work with Dom as a Shiatsu practitioner. Shiatsu aims to balance the energy flow in the body and, thus, releases any form of stress or tension from the body, with the idea that once energy flows freely, the body systems rebalance themselves. For Dom that might mean, once energy flows with fewer obstructions, spontaneous new movements or even brain connections can happen. It also means that a connection to the outside world is established with each session, as with all of his therapies, and the flow of life force energy in his body is supported. I work with what Dom offers on the day, which depends upon his mood, whether he’s sitting in a chair or lying in bed, his general health status and state of alertness. I try to focus on releasing his spine in each session and try to engage him through talking; for example, encouraging him to keep his neck long and swallow and breathe instead of drooling and coughing. Dominic is often engaged and alert which is encouraging to witness. Without all of the stimulation of his body and mind through shiatsu and other therapies, I feel he would be far less engaged and mobile and his immune system much weaker. These approaches are done by the strength training of his upper and lower limbs and trunk muscles. Functional electrical stimulation to the affected muscles is also given to strengthen the laryngeal and pharyngeal muscles while also giving trans-cranial stimulation to the service of the scalp to improve nerve facilitations. Talking to Dominic can improve cognitive skills helping the brain to form new neural connections which allows nerve cells to adapt and adjust in order to learn new skills, a process known as neural plasticity. Kinetic and proprioceptive approaches are adapted to improve balance, posture at different positions and improve vestibular balance. Neuro rehabilitation is essential for patients with head injuries and neurological deficits. It will help them to regenerate, relearn and regain lost motor and sensory abilities. I mainly practice Indian head massage on Dominic’s neck, shoulders, head, jaw and face.I then proceed with a Swedish style massage down his arms and his hands. Massage strokes include effleurage, tapotement, stroking and squeezing the muscles. The main benefit of massage is to increase blood flow around the body. For Dominic I focus mainly on the head. The increased blood flow will bring fresh oxygen and nutrients to feed Dom’s brain cells. It will also carry all de-oxygenated blood and any by-products away from the the head and brain to the lymphatic system for processing. This process of bringing fresh blood to the cells and removing by-products and toxins by lymphatic drainage can help strengthen Dominic’s immune system. The massage will help promote good muscle tone in the scalp, jaw and facial muscles. This should help Dominic use his mouth to make sounds or speak. It will keep the tone in his facial muscles for facial expressions. The massage is also beneficial for stress reduction. Although we do not know whether Dominic experiences stress or anxiety, the massage will help decrease stress hormone levels, this is important for keeping the rest of the endocrine system functioning normally. Circadian rhythms can be disturbed due to lack of stimulation or activity during the day, and massage can help promote better quality sleep by relaxing the nervous system and reducing stress hormones. We regularly remove dead skin by moving, dressing or brushing our hair. The massage helps to exfoliate and remove Dom’s dead skin cells and prevents a build up which can lead to other skin complaints experienced by patients with limited mobility. The main challenge working with Dominic is the lack of communication. However, he will move very quickly if you touch an area that is sensitive, which is good. You know straight away that it’s uncomfortable or he simply doesn’t like it. The other challenge is when Dominic’s head drops forward, although you can always position him back in the head rest or he can even sometimes re-position himself. There are days, although not nearly as many as before, where his head drops forward constantly during the session. This makes it difficult to have continuity and a flow to the massage. However this usually indicates that he is unwell, uncomfortable or is at the beginning of an infection of some kind. I feel Dominic responds well to the head massage. In the beginning Dom would push his head forward a lot, which rarely happens now. Also, he can move his head smoothly from side to side, whereas before, this movement was laboured. Another noticeable response is that he moves his mouth more and makes sounds. He seems initially very relaxed after a treatment and then very alert. I get the feeling he knows what to expect. There are few surprises and I feel there is comfort in that for him. On Friday the 17th of February, friends of Dominic will host their annual fundraiser. It will take place in the Blackrock Castle in Cork, and should be a fantastic evening. There will be live music by Cork band ‘Ruby Horse,’ with food, drink and a charity auction hosted by Dave Mac of Red FM. It is all set to be a wonderful evening! Get ready for some fun catch ups, music and maybe even a bit of dancing. Dominic is one of my closest friends since having boarded together in secondary school. He is for me synonymous with high energy activity; someone who thrives on pushing himself to new limits in work and in play. When the old eBid.ie crew, where we also worked together, decided to team up again for the Paris 2 Nice cycle; it seemed fitting. What was initially to be a big eBid.ie reunion was to become a little smaller, but none the less enjoyable reunion, as a number of the team, including our source of inspiration, Andrew MacChesney, fell by the wayside. I arrived from Amsterdam to Paris de Nord, with my bike on my back on a pretty miserable Friday evening in September. While my preparatory training could be easily stereotyped as “too little, too late”, I did manage the discipline to avoid drink in the previous month. For those of you unfamiliar with the Paris2Nice charity cycle; the group is composed of individuals and teams raising money for disparate charities dear to them. On entering the hotel lobby, I was immediately reassured to see a traditional Irish welcome posse, building up the Dutch courage for the challenge ahead. Not too long after, I met with Paul O’Kelly and Conor Jones sharing our first, of very many meals, of the week. It was great to be reunited and the scene was set for a memorable and thoroughly enjoyable week. As to be expected, there were many ups and downs along the way. Getting four punctures within the town limits of Montargis (a town of just 4,5KM2) would have to go down as a low-point (thanks again for your patience Conor!). The undisputable high points were reaching the top of Mont Ventoux and the final approach to the beautiful destination of Nice. In addition to rekindling old friendships with Conor and Paul, the cycle offered a great opportunity to meet new and interesting characters. I haven’t gotten on the bike since but am hopeful that I’ll get the itch again next year when the sun comes out, and achieve a lasting benefit from this wonderful experience. Thank you very much to all my generous sponsors. Cati and Tara had a lovely afternoon with so many of you showing up in support for their 4th annual craft sale in aid of the Dominic Morrogh Trust. Though Sonja and Elena were the stars of the afternoon, they took first place on being the the most convincing salespeople. 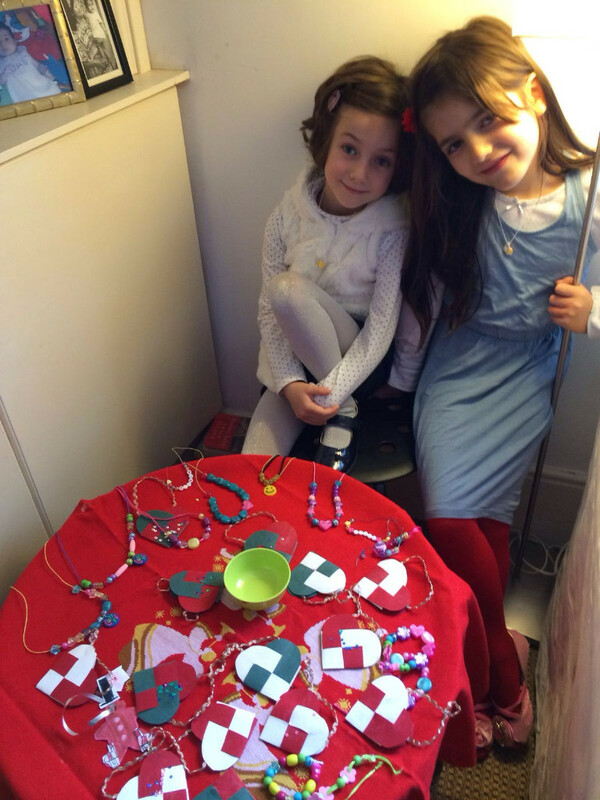 We don’t think anyone who came to the sale got away with not buying the crafts the two little ladies made! It was great to see all the friendly faces there to enjoy the festive atmosphere while getting some pre Christmas shopping in. Most important though was the catch ups and having all the kids take over the house.Thanks to all who stopped by. We look forward to the event next year!! Interested in organising a fundraising event for Dom? For anyone interested in raising funds for Dominic, whether sporting, social or other, please contact us at the trust for details on how to set this up: dominicmorroghtrust@gmail.com It’s easy, can be a lot of fun and we’re happy to help. Copyright © 2016 Dominic Morrogh Trust, All rights reserved.